Tired of doors that do not function properly? 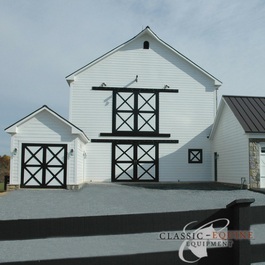 Classic Equine Equipment designs and builds Barn doors that operate as they should. Full wood doors are prone to warping and then quickly become unsitely or difficult to operate. Our steel framed doors allow for warm looking wood fill options, but a solid steel frame that will not warp and a sliding door track system that is second to none. 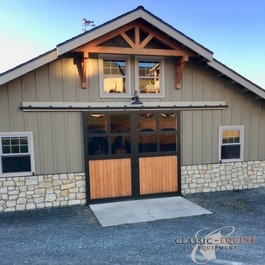 Classic Equine Equipment Barn End Doors are the perfect compliment to your horse barn, equipment building or venue barn. Available for all standard size entrances or custom designed to fit your breezeway. 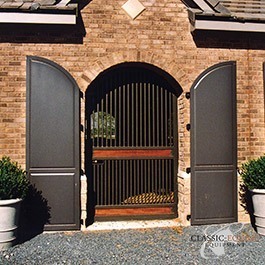 Classic Equine Equipment manufactures one of the most solid and dependable paddock barn doors in the industry. Available for a standard 48”x88” opening or we can make any size to fit your application. 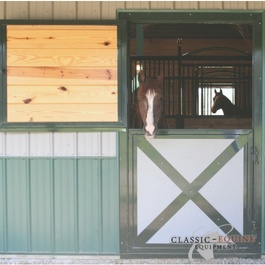 Classic Equine Equipment offers a variety of loft doors in standard and custom sizes. Hinged loft doors are pre-hung and feature weather tight jams and window options. Hinged loft doors use an adjustable hinge system and feature stainless steel hinge bolts and compartment latch.